3) DM presented itself as an 'Identitarian' grp; the US equivalent, #IdentityEvropa, sprang a massive leak recently (by way of @UR_Ninja), & you can follow the ensuing drama by way of #IdentifyEvropa. 4) DM got some media attn in NZ in DEC 2018 (stuff.co.nz/national/10940…). They employed the same stylee used by many equivalent grps in AUS, CAN, UK & US, & which will be familiar to AUS @facebook users -- where such material naturally & w #Facebook's approval proliferates. 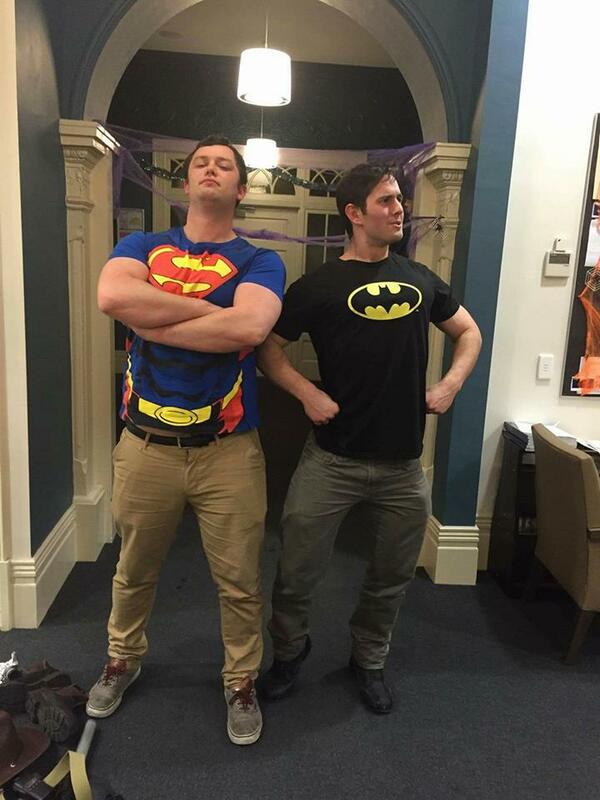 5) DM's fuehrer is a nipster named Jarred Randell Walsh (closest to camera) of #Wellington (their base). 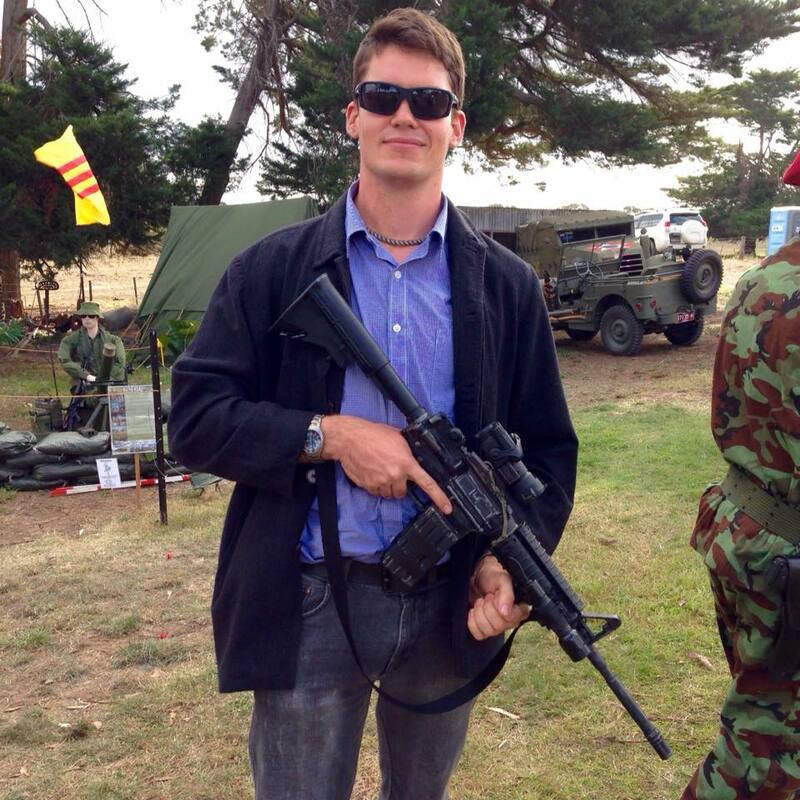 7) One link b/w AUS & NZ far-right is by way of neo-Nazi grplet 'Right Wing Resistance New Zealand'. Last year, one of its NSW members, Ricky White, was declared a 'terrorist' of sorts under the relevant NSW legislation. 9) Further inre RWR, NZ academic Paul Spoonley apparently declared in the court proceedings v White refed to above that *I* was Ricky White & I (ie, White) used my blog to promote RWR. (I wrote Spoonley to seek clarification but got no reply.) See : slackbastard.anarchobase.com/?p=44245. 10) In any case, Spoonley's views on Christchurch, terrorisms & nazis etc. can be viewed here: abc.net.au/news/programs/…. 11) And while I'm sure the Prof has done good & useful werk on the subject of the far-right in NZ, as a general rule it pays to examine both scholarly efforts along w activist accts of phenom. Plus, I'm really *not* Ricky White or a neo-Nazi member of RWR, mmmkay? No rlly. Who knew they got the experts in? Who knew they let the film stars in? 13) Anyways, in add to NZNF, DM & RWRNZ, another trans-Tasman connect is by way of boneheads, esp Blood & Honour & #Hammerskins. In which context, aside from arsons & related incidents, to best of my knowledge only attack upon mosque using gun was in Perth several years ago. 14) That (2010) incident involved a small no of boneheads, inc Bradley Trappitt (see : slackbastard.anarchobase.com/?p=19648). 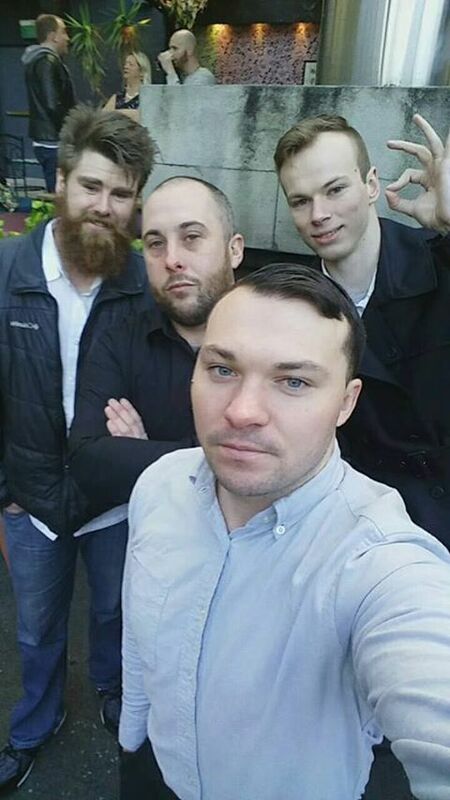 Years later, in late 2015/early 2016, Trappitt joined veteran neo-Nazi Jim Perren to halp organise the launch of the UPF's stillborn party 'Fortitude' in Toowoomba. 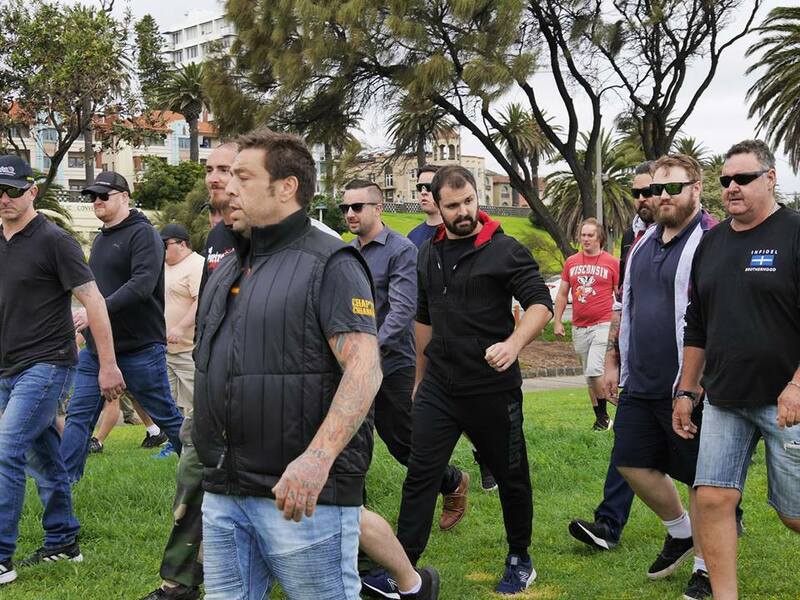 15) Note that the announcement of the party's formation after a #ReclaimAustralia rally in Perth in NOV 2015 took place @ the HQ of neo-Nazi grplet 'Aryan Nations'; its members later got into trouble for murdering a guy @ that loc, but whatevs eh. 16) To return to Hammerskins, the network has a long & bloody history (it's proscribed in ESP, GER, POR) & gained a particular claim to fame when one of its members, Wade Michael Page, conducted a massacre @ a Sikh temple in Wisconsin in 2012. See : slackbastard.anarchobase.com/?p=31996. 17) Massacring worshippers in this fashion was deemed by some to be v Bad behaviour, but AFAIK it had no impact upon the Hammerskins in AUS (or NZ) & the boneheads operate w relative impunity in both territories. 19) As for Page, he was also connected to another neo-#Nazi gang called Volksfront. It was born in the US prison system, but officially dissolved foll the massacre in WIS (which was a bit embarrassing apparently). 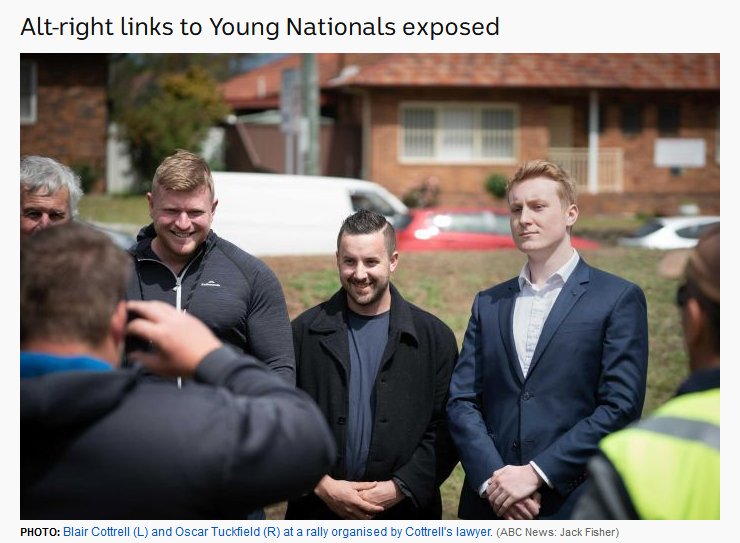 23) While #Anning was in MEL in OCT 2018 for the Freeze Peach event (slackbastard.anarchobase.com/?p=43653) organised by Blair Cottrell's lawyer John Bolton, MM, along w Bolton, Cottrell & var other worthies, attended the SYD leg. L to R: Bolton, Cottrell, MM, Oscar Tuckfield. 25) All these guys f*cking love guns eh. 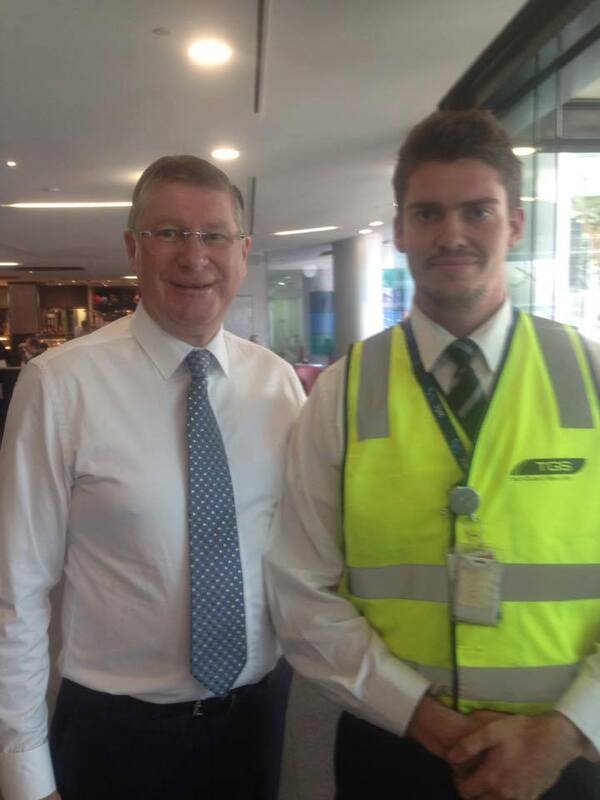 Here's security industry worker Stuart Von Moger (w ex-VIC premier Dennis Napthine / posing w gun). He's been encouraging his fellow Lads to find work in the industry ... 'cause they get to play w guns & push ppl around & stuff. 1) Hey it's time for me to goto bed, but one final thing inre #eggboy/#eggboi. As noted, neo-#Nazi Neil Erikson was one of the 5 or 6 men who, er, restrained the teen; Erikson has criminal convictions for antisemitic (FEB 2014) & anti-Muslim (SEP 2017) actions. 2) Perhaps in order to complete the trifecta, last year (MAY 2018) he was also charged w disrupting a church service -- which involved him & some of his thuggish mates invading Gosford church & scaring some elderly parishoners. 3) He's due back in Melbourne Magistrates' Court on MAY 13 to face charges of riot/assault/affray stemming from the Melbourne date of the DEC 2017 Milo Yiannopoulos tour; joining him in court on same will be his sidekick Ricky Turner & old nazi chum Richard Whelan. TBH, shocking as it is, I'm not that surprised at the #Christchurch massacre, or that the alleged killer livestreamed his assault on @Facebook. There's literally thousands of pages dedicated to spreading murderous Islamophobia on the platform, w an audience of many millions. Josué Estébanez, a neo-Nazi who stabbed a teenage antifa, Carlos Palomino, to death in Madrid in November 2007. The murder was ofc celebrated @ the time by local neo-Nazis, including Neil Erikson. Congratulations to Ralph Cerminara on finally succeeding in his decade-long campaign to get himself locked up for being a racist kvnt in public. 1) As noted, Cerminara was once Der Fuehrer of one iteration of the anti-Muslim 'Australian Defence League', est 2010 & modelled on Yaxley-Lennon's EDL (Yaxley-Lennon is being toured, along w Gavin McInnes & Milo Yiannopoulos, by @PenthouseAU in April). 2) That ADL didn't get v far, but did serve as the avenue by which Shermon 'The Great Aussie Patriot' Burgess was 'radicalised'. Burgess is now, perhaps inevitably, a Hitler fanboy; in the last few years Cerminara has been vociferously denounced by him as a violent drunk. Sad! I've had some interactions with Nordic etho-nationalists living in the US on social media. The phenomenon is pretty strange given that these people themselves were immigrants to the lands they are living in 1-3 generations ago. 1. They are in the process of questioning and negotiating their Christian identity. They want to decouple Christianity from being white because there is an influx of Christian immigrants from Latin America & Africa. No diff otherwise. Sejak semalam,Hampir semua masjid di negri2 Barat jamaahnya bertambah hingga 3 kali lipat.Sebagian ummat Islam disana yang sebelumnya tidak pernah atau jarang terlihat di masjid,Sejak maghrib kemarin hingga subuh berebut datang menghadap kepadaNya. Mereka memenuhi rumah rumah Allah bukan sekedar untuk menunjukkan solidaritas. Lebih jauh lagi mereka sedang mengadu kepada Allah tentang kedzaliman demi kedzaliman yang terjadi sejak hari-hari sebelum ini, Dengan puncaknya kemarin itu di New Zealand. Sekaligus mereka berdoa, Berharap perlindungan, Serta memasrahkan segalanya, Yang akan terjadi hari ini dan di masa depan, KepadaNya. 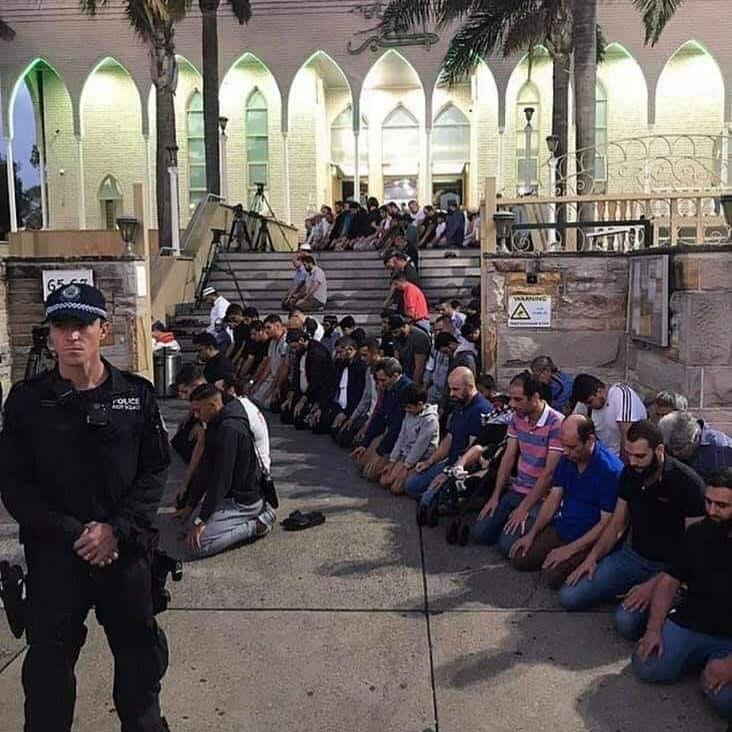 Temen saya di Australia, Yang selama ini idupnya urakan, Mendadak 3 waktu terakhir hadir shaf depan di masjid dekat rumah. Amateur crisis actor breaking character before his scene ends. What a dork. After Aristotle's climate theory and the Biblical Curse of Ham were no longer the primary theories of white supremacy, Eugenics took their place. 20th-century eugenicists—in the US and Europe—perpetuated the fake science of white genetic superiority. This false idea of genetic white superiority fuels the fear of "white genocide" we see playing out across the globe today. The age-old fear that immigrants would "infest" and "replace" whites hit a fever pitch during the recent refugee crisis. Reading the apparent manifesto of the #NewZealandMosqueShooting #NewZealandShooting #NewZealandTerroristAttack & it's clear that one person above all - Anders Breivik - especially inspired the shooter, and another person, above all, built the motivating ideology. Trump knows him. The apparent manifesto of the New Zealand mosque shooting terrorist is tricky. He calls himself an "eco-fascist" but says nothing of ecology. He trolls (probably) Candace Owens. He also cites other terrorists who have especially inspired him, such as Dylann Roof & Anders Breivik.